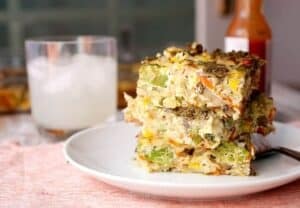 This breakfast casserole has about as many veggies as you can pack into one dish. Eat a good breakfast, people! 1) Preheat oven to 375 degrees F. Slice mushrooms, chop peppers, rinse and chop leeks, and cut off broccoli florets. Whisk eggs with milk and set aside. 2) In a large skillet over medium heat, add olive oil along with mushrooms, peppers, leeks, broccoli, and carrots. Cook for 6-7 minutes until veggies soften and mushrooms release their liquid. 3) Add in shredded potatoes and corn to the skillet and cook for a few more minutes. Season with salt and pepper. 4) Spread the veggies out in a 9×13 baking dish and dot with pesto. Then pour in egg mixture and spread it around so the eggs are even. Season with salt and pepper. 5) Bake the casserole for 40-45 minutes until eggs are puffed and cooked through and edges are browned a bit. Cool the casserole for a few minutes, slice, and serve with hot sauce! This delicious recipe was brought to you by Macheesmo. Read the full post at https://wp.me/pkSYO-dvV.